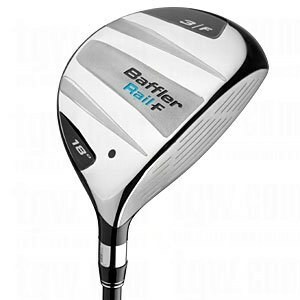 This is the Baffler Rail Fairway wood, a tried and true Cobra design that has been around for 30 years. The dual rail sole catches your eye right away. The idea is to get the club moving through the rough with the smallest amount of turf drag. This is big of course when you are trying to hit a shot out of heavy rough over a lake. You should also notice that the face is very shallow. This also makes it easier to cut through the rough and is very pleasing to better golfers that like to work the ball with their fairway woods. Finally, the face is very hot. It is made with a thin insert to improve ball speed. With the baffler rails, the shallow clubface, and the hot face, this makes this fairway wood a valuable weapon to add to your quiver. I like this club, especially for mid to low handicappers. The club is very easy to swing and workable through the rough. For higher handicappers, I recommend the TaylorMade Lady Burner SuperFast Fairway Wood. This wood has a huge 200cc clubhead shaped like a jet plane.